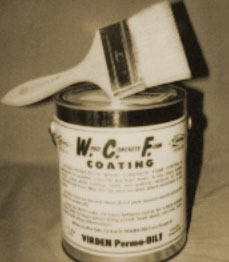 Originally Virden Perma-Bilt invented this coating for all types of foam product protection. Then, later field tests proved excellent results for water-proofing all types of wood surfaces. So now, we offer this new inexpensive WCF coating (it’s not quite as good as our famous Epoxy Tank Coating) for jobs that do not need the BEST! This NEW, durable coating is designed for foam and wood. Compared to urethanes, epoxies, and plastic coatings — it does the job at great savings! Snow white in color, it refracts the sun’s heat wonderfully. Will not fade or chalk, and adhesion is excellent. Regular paint weighs approximately 7 Ibs. per can. Our coating for foam and wood weighs 13 Ibs. per gallon. This coating is NOT a paint. WCF Coating is a very heavy-bodied viscous coating that SEALS! Very easy to apply. Simply brush on two coats for a powerful sealing capacity. Virden Perma-Bilt offers a very durable hard shell coating specially formulated for the adhesion and protection of all type foams. Unaffected by sunlight, ozone and water. This permanent coating is a must for all foams that are exposed to weather. Available in 1 gallon and 5-gallon containers. FOAM COAT does an outstanding job protecting various foams, styrene, urethane, etc., from bad weather, birds, insects, etc. If possible turn containers upside down for two to three days before mixing and using. 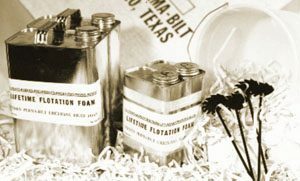 Add no solvents or thinners to the Foam Coat (the only exception to this is when extreme settling has occurred and a small amount is used to loosen the bodied pigment at the bottom of the container.) (Most solvents will attack the foam.) Apply generously by brush, two coats (8 hours between coats) are desirable for the proper millage. Cure 24 to 48 hours. Call 806-352-2761 for more information about our wood and concrete water proofing foam coatings.